Updated! I have a NEW favorite chocolate frosting. The old version (below) is good, but requires actual chocolate. 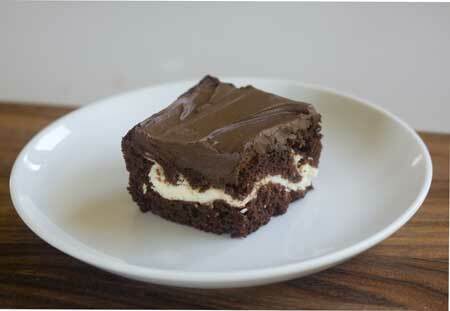 This one is a cocoa based frosting, but the addition of heavy cream and sour cream makes it so much better. Here it is on a special chocolate cake called Double Fudge Fanciffill (I love that name). And you can see it again in the top picture which is a Hershey’s Perfectly Chocolate Cake. The is my favorite frosting because it’s easy and tastes good. For the cocoa powder, I always use “natural” style like regular old Hershey’s or Scharffen Berger or Ghirardelli. Also, remember that frosting is a personal thing and that you should adjust the liquid and sugar to taste, so taste it as you go and use the recipe just as a guideline. Make sure all your ingredients are at room temperature. The butter should not be too cold, nor should it be melted. In a large mixing bowl or the bowl of a standing mixer, mix the butter, sour cream, cocoa, salt and 2 tablespoons of the half and half until it all starts to come together as a thick sludge. This is my old favorite icing. It’s good too, but it practically solidifies in the refrigerator, so keep that in mind. It will soften as it sits at room temperature. This is one of my favorite chocolate frostings. It become firm when refrigerated, so make sure you bring your cake to room temperature before cutting. Also, make sure all ingredients are at room temperature. Melt both chocolates in microwave or double boiler. Set aside to cool for about 30 minutes. Beat the butter until creamy. Stir in the cocoa power and a cup of the powdered sugar. Add the cooled melted chocolate. Scrape sides of bowl and beat well. Add remaining powdered sugar, then add milk, vanilla and salt, beating and scraping creamy and smooth. Make sure ingredients aren't too cool. Oreo Stack Brownie -- Better! Glad you like it, Sandra! Thanks for saying so :). Hi Jennifer, this is a great frosting for that cake! I hope you like it. Email me and let me know, because this is one of my favorites. It makes a lot of frosting and you *should* have enough for that size cake. Just remember to keep you ingredients at room temperature. If you had cool butter to the chocolate mixture, the chocolate might lump up a little bit. Hi. I’m going to make Shirley Corriher’s Magnificent Moist Golden Cake for Easter (decorated with yellow peeps to look like a sunflower.) And want to frost it with chocolate frosting. Do you think this recipe would be a good choice for that? I am going to make either 2 or 3 nine inch layers… Would I need to double the recipe?